Hello Grand Re-opening of Sanrio Japanese Village and Sanrio Kawaii Mart! Ringing in the cutest news to hit this summer is the grand reopening of the Sanrio store at Japanese Village! Located in Los Angeles’ Little Tokyo, this place has been a favorite spot of mine and many Hello Kitty Foodies who are looking for the cutest and best Sanrio merchandise! The grand-reopening kicked off Thursday with a VIP party and the official grand opening was this Friday, August 18, 2017! Walking into the newly remodeled store, one is instantly hit with cuteness overload. I love seeing Hello Kitty and friends up above welcoming everyone! Hello; Hello Kitty, Keroppi, My Melody, Chococat, Tuxedo Sam, Badtz Maru, Kiki and Lala! It is true Hello Kitty heaven in here! The cuteness continues on as more of our favorite characters are all over the store! I have to admit, I am super egg-cited! Meh…can’t be lazy, must buy some Gudetama merchandise ;). No reason to be an angry panda today! Aggretsuko gets lots of love at Sanrio Japanese Village! As one makes their way back to the store, there is a very special surprise in store! The Sanrio store has a new gigantic spot in the back that will be used throughout the year for special pop-up shops, events and more! The first pop up there is the Sanrio Kawaii Mart. The Sanrio Kawaii Mart is a supercute convince store-styled market that was inspired from the Hello Kitty Yata Supermarket in Hong Kong. Sanrio Kawaii Mart has a Sanrio products for every Hello Kitty fan’s every day needs. “Donut 🍩” worry! If you need a little sweetness in your life, you can find it here. Ham, eggs, cheese and Hello Kitty 🍔? Please give me all the toppings. 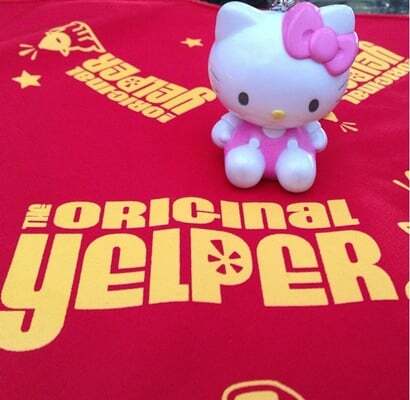 You will be sure to be Hello Kitty happy when you are Hello Kitty hungry. There’s plenty of Sanrio goodies from baking products to candies and beverages! Drinking is delightful and delicious with Kawaii soda! It’s always cute and cold with Kawaii ice too! Beep, beep, everyone’s cute Hello Kitty car needs are covered here as well! Lastly, you can always be Hello Kitty pretty with all the healthy and beauty products offered here. If you get hungry, while shopping. Why not grab some Hello Kitty candy? For everyone’s shopping pleasure there are lots of Sanrio Kawaii Mart baskets to put all your goodies in. Also, you want to be sure to grab a Sanrio Kawaii Mart re-useable bag. I’ll be sure to bring some friends along as well for next time. Hmm, I think I will write them using some Sanrio Kawaii Mart postcards! What can I say? Sanrio Kawaii Mart is super kawaii! For more smiles, please my Yelp review on Sanrio Kawaii Mart!